German authorities descended on Deutsche Bank AG, including its downtown Frankfurt headquarters, in a coordinated raid related to a Panama Papers investigation. 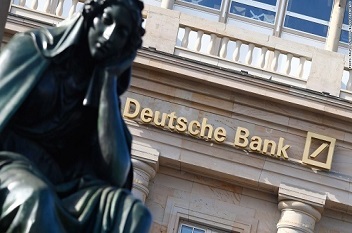 German authorities descended on Deutsche Bank AG, including its downtown Frankfurt headquarters, in a coordinated raid related to a money-laundering investigation. More than six police vehicles, their blue lights flashing, pulled up to Deutsche Bank’s main offices shortly before 9 am, in an operation involving about 170 officers. The main suspects in the probe stemming from 2016 disclosures known as the Panama Papers were two bank employees who were not identified beyond their ages -- 50 and 46. Authorities seized documents and electronic files and said they were also looking at whether others might have been involved. “As far as we are concerned, we have already provided the authorities with all the relevant information regarding the Panama Papers,” Deutsche Bank spokesman Joerg Eigendorf told reporters in Frankfurt. For the beleaguered German lender, the raid adds to a panoply of headaches -- commercial, regulatory and legal -- facing Chief Executive Office Christian Sewing and Chairman Paul Achleitner. The stock has lost almost half its value this year, after sliding about 3% on Thursday. The cost of insuring its junior debt against losses jumped 11 basis points to 383 basis points, the highest in two years, according to data compiled by CMA. The subsequent investigations exposed evidence Deutsche Bank helped clients set up off-shore accounts, prosecutors said. The officials said the Thursday raid wasn’t related to its role as a correspondent bank for money laundering at Denmark’s Danske Bank.